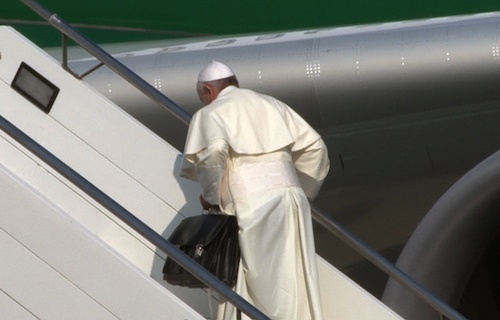 Pope Francis carrying his own bags while boarding the plane for Brazil. I have thoroughly enjoyed watching both the preparation for Pope Francis’ visit to Brazil for World Youth Day and his initial landing. Although I am not in Brazil, I am an avid “Pope-Watcher” and have dedicated myself to a digital pilgrimage of sorts – following #Rio2013 events from afar. I believe, as the leader of the Roman Catholic Church, Pope Francis is one to be watched, listened to and imitated by the faithful. In the first months of this new pontificate it can be said of Pope Francis that he is worthy of imitation. As Paul charged the Galatians in chapter 4:12a to, “become as I am” emulating his loyalty and fidelity to the Gospel message so too Catholics are charged to be like Pope Francis and live out the Gospel message in DEED and WORD. There are a couple of thoughts I want to leave with you regarding both his preparation for #Rio2013 and his landing in Brazil that have already made a strong impression on me. This being his first international trip of this pontificate, I and millions of others are watching. Here are my thoughts. Pope Francis takes his role as Bishop, chief shepherd, seriously. Therefore he senses the call to be close to people. Especially those who live on the margins of society. The Pope is more concerned about our lives, our spiritual welfare and that of the world community. Access / closeness to people trumps personal security concerns. That which is eternal has trumped that which is earthly. He refuses to be confined, handled or otherwise manipulated into being (or turning into something) he is not. Life Lesson: Many of us, faithful Catholics and Protestants, have been shaped or influenced by a culture consumed with self, self-indulgence and self-importance. It is in this light that we have grown cautious or guarded with our lives. We have so bought into the idea of personal security that we now live isolated lives. It is in this climate that we profess a faith that we are unable to live – to its fullest extent. No wonder people who have tasted death or know that they are about to die, live radically different lives than they lived prior to this certain knowledge. Today is the day that we should contemplate the trajectory of our lives. Are we living safe, uneventful lives where real risk is factored out in favor of perceived safety? Are things eternal in nature secondary in importance / priority to our earthly concerns? Can you say today that you are living the faith you profess to believe in? The second observation I made was how Pope Francis was greeted upon his arrival in Brazil. It has been well reported that the motorcade made a wrong turn which resulted in the subsequent mobbing of Francis’ personal vehicle by excited Christians. While it was reported that the Pope’s secretary was a bit unnerved, Pope Francis made it a point to state that he felt safe and was warmed by the passionate greeting of the people in Rio. All I can say is WOW. Now I say this in light of the fact that as I worked in my office on that day I watched video streaming of Pope Francis’ landing and motorcade transition. 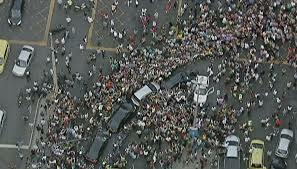 I was nervous at the obvious misdirection of the motorcade and the subsequent mobbing of the vehicle. I say this because I know how easy it would be for an overzealous Catholic or nefarious individual to somehow injure the Pope thus derailing his purpose for visiting Brazil in the first place. Of course – my concerns for the Pope’s safety came to nothing. But – it caused me to think! Have I lost my sense of the wonder and adventure that is intertwined with the Christian faith? Am I more concerned with the person of the Pope (Jorge Mario Bergoglio) than what he represents (St. Francis of Assisi / Bishop of Rome)? Question: How has my attitude confined me to embrace a “safe / an easily explained” faith? Life Lesson: Our faith is both factual, historical, credible and mysterious. It is concrete and fluid. It is unchanging and evolving. It can’t be understood by the mind alone. This being the case, I wonder how often I require my faith to be something other than what it actually is? How often do I ask faith to fit into my box? How often do I ask God to answer my prayers in a way which makes sense to me (human understanding alone)? The truth is this – our Catholic faith is a call to experience God, explore truth and express faith. It is a call to adventure! It is awe-inspiring. It is beautiful while at the same time challenging – causing one to consider giving up everything to follow in the footsteps of Jesus. The Catholic faith challenges us to be counter-cultural, selfless and open to the will of God and ways of the Holy Spirit. It is calling all of us to become Saints. I hope you will journey with me and consider the messages that will surely follow during this World Youth Day (week). Christ is in the people. We separate ourselves with a grave risk to the authenticity of the gospel. Christ was incarnate amongst us and we are invited to become an incarnate church – with the poor (in the broadest definition of that term) forever being the place to start. Jesus began in Galilee – and as someone once said, ‘Can anything good come out of Galilee?’. Pope Francis reminds us that the gospel message is most welcome at the margins of society. Just finished Scotland’s Rio. Was brilliant! Viva il Papa! So glad you had a great time. If was fun to watch on TV and the internet. Poland 2016.